PDF FILE ACCESS NOTE: On many systems, right click on the title, choose the 'Save Target As ...' option (or 'Save Link As' option) from the pop-up menu, and save the pdf file to local storage. Next choose the 'Open' option to view the pdf file with Acrobat Reader running as a standalone application. NOTE: Unifor is Canada's largest union in the private sector, with more than 300,000 members. It was founded Labour Day weekend with the merging of the Canadian Auto Workers and the Communications, Energy and Paperworkers union. SOURCE: Martha Grevatt is a UAW activist. E-mail: mgrevatt@workers.org. NOTE: Join us for brunch and a fundraiser as we celebrate the 37th birthday of Jorge Parra, President, Association of Injured Workers and Ex-Workers of GM Colombia (Asotrecol) and the fifth anniversary of Autoworker Caravan. NOTE: Four video segments of the three prominent UAW shop floor activists (Sean Crawford - 23 minutes, Scott Houldieson - 17 minutes, and Gregg Shotwell - 19 minutes) describe current life on American assembly lines and keeping resistance alive. Folow-up with a Q&A - 60 minutes. Organized by the Labour Committee of the Greater Toronto Workers' Assembly. Recorded in Toronto, 26 October 2013. NOTE: Appeal, flier, and registration form included - Buses leave Detroit for Fort Benning, Georgia on Friday evening Nov 22 and return in the early morning of Monday Nov. 25, 2013. It's free of cost; you pay for the motel room and meals. NOTE: Includes video of journalist, broadcaster and author Jeremy Paxman interview of Russel Brand on "BBC Newsnight"
TITLE: Russell Brand on revolution: “We no longer have the luxury of tradition” - But before we change the world, we need to change the way we think. NOTE: Russell Brand is guest-editing the issue of the New Statesman out on 24 October. - When I was asked to edit an issue of the New Statesman I said yes because it was a beautiful woman asking me. I chose the subject of revolution because the New Statesman is a political magazine and imagining the overthrow of the current political system is the only way I can be enthused about politics. NOTE: The North American Labor History Conference is sponsored by the Department of History and the Walter P. Reuther Library of Labor and Urban Affairs, Wayne State University.The conference is happening this weekend, October 24-26, 2013 at WSU McGregor Conference Centerin Detroit. TITLE: UNIFOR – WILL ACTION MATCH THE RHETORIC? NOTE: The Sept. 8 Autoworker Speakout sent this solidarity statement to their German Opel counterparts. The German Opel counterparts responded with a report and thank you message in four languages. SOURCE: Lindsay Hinshelwood has been referred to as "the most outspoken critic of the CAW" is an activist in Unifor Local 707 in Oakville, who ran for president of Unifor at the new union's founding convention at the Metro Convention Centre in Toronto. NOTE: This YouTube channel is maintained by Lindsay Hinshelwood, an activist in Unifor Local 707 in Oakville, who ran for president of Unifor at the new union's founding convention at the Metro Convention Centre in Toronto. TITLE: Rebuilding a fighting UAW - Gregg Shotwell, a retired autoworker and author of Autoworkers Under the Gun: Live Bait & Ammo, questions what it would take to reinvigorate the United Auto Workers. TITLE: Rank and File Worker Challenges for Unifor Leadership: Meet the New Unions - Same as the Old Unions? NOTE: All of the leadership positions had “Unity Team” members acclaimed, meaning no one ran against them. All, that is, except for one. Lindsay Hinshelwood, a rank and file worker at Oakville Ford and member of Unifor Local 707, threw in her hat to challenge the leadership at the last minute. Not only that, but she provided a real alternative vision to the business-as-usual attitudes. NOTE: Presiding over the convention was Dave Coles, National President of CEP. The nominator for Jerry Dias was Roland Kiehne, president of CAW Local 112 Toronto. The nominator for Lindsay Hinshelwood was Bruce Allen, vice-president of CAW Local 199 St Catharines. Several other delegates are shown speaking to the assembly in turn. 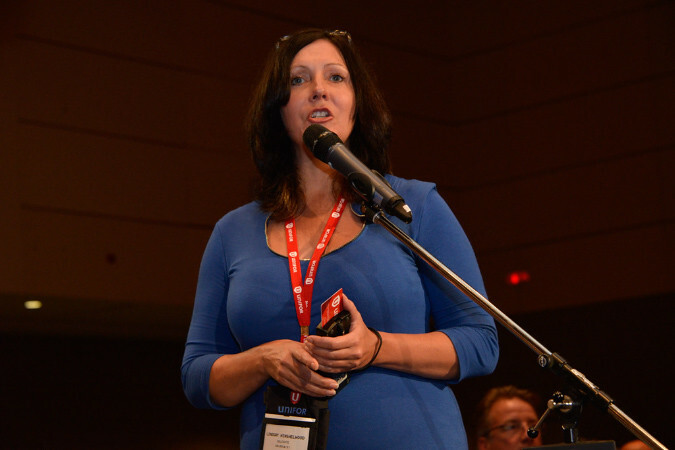 NOTE: Lindsay Hinshelwood, an activist in CAW Local 707 in Oakville, ran for president of Unifor at the new union's founding convention at the Metro Convention Centre in Toronto. NOTE: Excerpt: Dias was the clear star at the convention, bringing the entire crowd to its feet amid cheers of "Jerry!" several times over. However, in a surprising development, his nomination did not go unchallenged. Lindsay Hinshelwood, a member of the former CAW local 707 in Oakville, Ont., ran against Dias. "This is our founding convention, and this is an opportunity to challenge the top and it had to be done," she said, explaining she was motivated by the hopes of cracking what she calls the "old boys club" of the leadership. Hinshelwood ended up garnering just over 17 per cent of the vote. "That's a strong message to the experienced leadership that 20 per cent [sic] of their delegates that want change." NOTE: Lindsay Hinshelwood, an activist in CAW Local 707 in Oakville, speaks to the assembled delgates during the new union's founding convention at the Metro Convention Centre in Toronto. 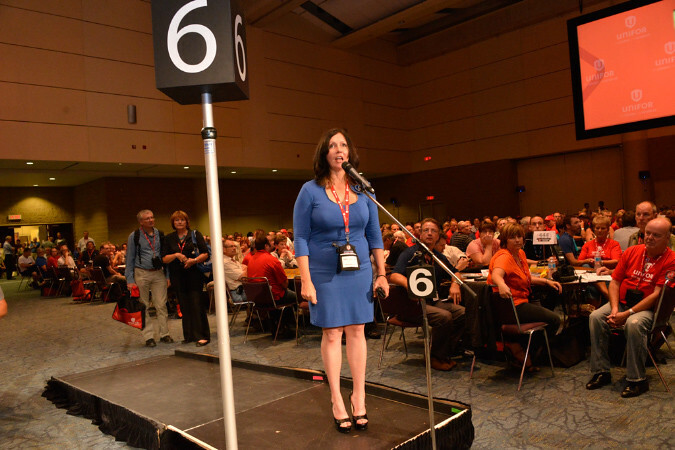 NOTE: Lindsay Hinshelwood, an activist in CAW Local 707 in Oakville, ran for president of Unifor during the new union's founding convention at the Metro Convention Centre in Toronto. 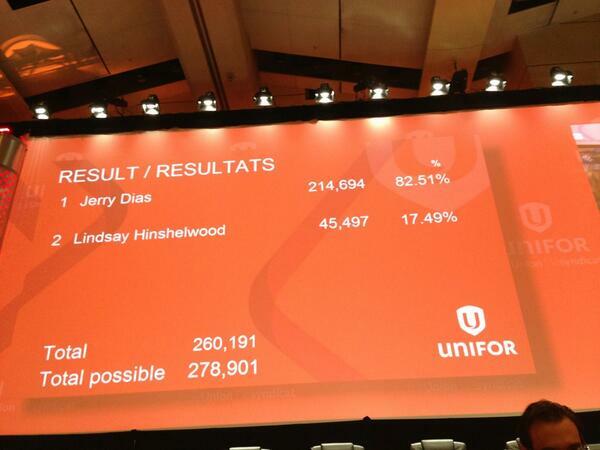 TITLE: New super-union Unifor elects first president - Former de Havilland worker Jerry Dias easily defeats lone opponent at founding convention. NOTE: Excerpt: Dias, who was a top assistant to retiring CAW president Ken Lewenza, easily defeated Lindsay Hinshelwood, an activist in CAW Local 707 in Oakville, at the new union's founding convention at the Metro Convention Centre. TITLE: WANTED - Outspoken UAW Members - Tell Your Workplace Stories! Hear Other UAW Members Stories. Share Ideas to Improve the UAW! NOTE: This proposed amendment to the UAW Constitution needs to be passed by as many local unions as possible. NOTE: The flyer has links to the conference website and registration for the Jerry Tucker memorial conference Saturday Oct 11,12, and 13 2013 in St. Louis, MO. This should be fun and exciting for anyone interested in rabble rousing and organizing. NOTE: For more than 30 years, Jerry Tucker was an inspiring figure of the labor movement. His untimely passing in October 2012 was mourned by many in the labor community and beyond. Over the years, Jerry was a rank-and-file worker, union leader and adviser, and mentor to many. This conference explores Jerry's work within the labor movement and examines the fundamental question that he wrestled with throughout his long career: How do we build a powerful social movement and exercise the collective might of the working class through true solidarity, accountability and democracy? We will discuss how to apply Jerry’s vision to today’s struggles, and we will celebrate his extraordinary life through music, videos and personal testimony. NOTE: With psticipation by Attorneys for Plaintiff Fiat North America LLC. / Attorneys for Defendant Brock Fiduciary Services LLC, Appearing on behalf of Defendant and Counterclaim Plaintiff UAW Retiree Medical Benefits Trust in its capacity as the Independent Fiduciary for the UAW Retiree Medical Benefit Trust (Chrysler Separate Retiree Account). NOTE: The list is a spread sheet that contains the local unions that were eligible to attend the 35th Constitutional Convention. This list has the Local number, Region, City, State, workplace if not amalgamated, number of delegates, voting strength per delegate, total voting strenght, and whether the local actually attended. TITLE: Colombian Labor Pains - What is possibly happening in Detroit that would drive a man to have his lips sewn shut? TITLE: MEDIA ADVISORY - For Immediate Release: DEMONSTRATORS TO GM: ABIDE BY COLOMBIAN LABOR LAW - SETTLE WITH INJURED GM WORKERS. WORKERS ARE NOT DISPOSABLE! TITLE: JUNE 6 - TELL GM: WORKERS ARE NOT DISPOSABLE! TITLE: DEMONSTRATE! GM WORKERS ARE NOT DISPOSABLE! SOURCE: Michael Warren, Associated Press - Associated Press writer Almudena Calatrava contributed to this report. NOTE: Our report on the hearing on the Chrysler skilled trades ratification appeal. George Windau (Local 12), Martha Grevatt and Alex Wassell (both from Local 869), with their attorney, Ellis Boal, spoke for the appeal. TITLE: Who Will Lead the U.S. Working Class? SOURCE: Michael D. Yates(mikedjyates [at] msn.com) is associate editor of Monthly Review and editorial director of Monthly Review Press. He is the author of Why Unions Matter and Cheap Motels and a Hot Plate, and the editor of Wisconsin Uprising: Labor Fights Back, all published by Monthly Review Press. NOTE: This article is based upon an interrogation of two books: Gregg Shotwell, Autoworkers Under the Gun: A Shop-Floor View of the End of the American Dream (Chicago: Haymarket Books, 2012), 200 pages, $17.00, paperback; and Jane McAlevey with Bob Ostertag, Raising Expectations (And Raising Hell): My Decade Fighting For the Labor Movement (New York: Verso Books, 2012), 318 pages, $25.95, hardcover. Each book is about an iconic union. Gregg Shotwell writes about the United Auto Workers (UAW), and Jane McAlevey the Service Employees International Union (SEIU). What they report gives us reason for both deep concern and hope concerning the future of organized labor. NOTE: Saturday, April 27 at 9:00 AM - Marriott Renaissance Center Hotel, 400 East Jefferson Ave, Detroit, Michigan 48226, RICHARD meeting room. NOTE: Dan Akerson, chairman and CEO of General Motors Company, will be the keynote speaker for the Habitat for Humanity of Michigan's 2013 Awards Banquet on April 24, held at the Kellogg Center in East Lansing. Join with The Michigan Coalition for Human Rights and do what you can to convince Habitat for Humanity of Michigan to convey to him the importance of resolving the situation of the injured Colombian autoworkers of ASOTRECOL. NOTE: This is the latest version of the referendum amendment to the UAW Constitution. TITLE: "SHIFT CHANGE" is a documentary film that inspires us to think “out of the box” and look at alternatives we can implement now that will create a model for the kind of economy we want – democratic, sustainable and with community benefits and broad-based prosperity. TITLE: Ending the Dues Check-Off: Forcing Union Renewal? SOURCE: Sam Gindin is the former Chief Economist of the Canadian Auto Workers union, and is the co-author of The Making of Global Capitalism: The Political Economy of American Empire, Verso, 2012. TITLE: Someone outta tell the new Chrysler that when Autoworkers get screwed, they multiply!!! NOTE: PLEASE HELP ~ Brother Alex Wassell has been unjustly suspended without pay on March 1, 2013, for exercising his right to grieve his working conditions by PROTESTING the AWS Schedules (Alternative Work Schedule) at Chrysler Warren Stamping.. NOTE: ~ Please Call and Fax both Chrysler and the UAW and tell them retribution for peaceful protest is wrong. TITLE: PBS Documentary Participation Call - Dream On - Help make the injustice of two tier part of this documentary. Feel free to contact the producers! TITLE: Your Legal Rights: The NLRB reaffirmed UAW Local 869 member’s legal rights to peacefully demonstrate against the proposed alternate work schedule (3-2-120) this Thursday. NOTE: A call was made to the NLRB (National Labor Relations Board) this morning February 25, 2013. TITLE: PLACARDS: Some points to stress at the Warren Stamping alternate work schedule protest this Thursday, Feb 28th. NOTE: Bring signs, make noise, invite your family, friends, and union brothers and sisters to the protest demonstration near the assembly side (south) hourly entrance at the Warren Stamping Plant on Thursday, February 28, 2013 from 1:30 to 4:30 PM at 22800 Mound Rd, Warren, MI. TITLE: Warren Stamping Plant Demonstration - Let our voices be heard and make a little… Sound on Mound! NOTE: Show your support for workers seeking to organize a union at the Nissan North America automotive plant in Canton, Miss. NOTE: Nissan workers in Canton, MS want to decide whether to join a union, free from intimidation. Workers want a voice. Use yours to ask Nissan to Do Better. NOTE: This call has been launched by trade unions from Europe, Africa, America and we have diverse affiliation or non-affiliation to the International Trade Union Confederation, the World Federation of Trade Unions. We laso participate in various international trade union networks, etc. All our unions recognize the unionism of struggle, workers' democracy, self-organisation of workers and the need for social transformation. TITLE: Auto Workers Protest 'Maquila' Conditions in U.S. TITLE: 2013 NAIS Demonstration - Save the workers; Save the Community; Save the unions; Save the planet! NOTE: Demonstrate Sunday, January 13 and Monday, January 14, 1:30-3PM across from Cobo in downtown Detroit, at the 2013 North American Auto Show. TITLE: Demonstrate at the International Auto Show Jan. 13 & 14! TITLE: Ontario Next Right-to-Work Target? SOURCE: Labor Notes - David Bush is a Hamilton, Ontario, activist whose work has appeared in Canadian Dimension, Briarpatch Magazine, Common Dreams, and Rabble.ca. He belongs to Canadian Union of Public Employees Local 3906.